Description A black and white photograph showing the South Island Main Trunk [S.I.M.T.] railway line camp north of Kaikoura known as Aniseed Village. All the houses are two-bedroomed and there are many of them. A scan of this photograph will be used in the Changing European History Gallery 3 display in commemoration of the Marlborough Provincial 150th anniversary on 1 November 2009. Aniseed Village north of Kaikoura. This railway construction village existed from the late 1930s into the World War 2 years. On a sloping terrace, partly sheltered from southerlies by the bushed bluff at the rear, it was a cold site in winter time. ranges, in the way soon slowed progress. Work also began northwards from Christchurch and found problems at that end too. In 1930, the Depression halted all work leaving a gap of 128 km, along the rugged Kaikoura Coast. By 1936, the Labour Government re-opened construction, from both ends, to close the gap. An ever-extending line of public works camps sprang up from both ends. Whole families arrived to live in prefabricated cottages. Each camp had a school, and a hall. Visiting butchers, bakers and grocers arrived weekly from Kaikoura, or Cheviot. The Aniseed camp and Valley of the Moon camp shared a school. One, or two, townships supported a small general Store. Single men's camps were more spartan, often being sited on the damp foreshore. Each man had his own hut, and fireplace, and ate at the camp cookhouse. 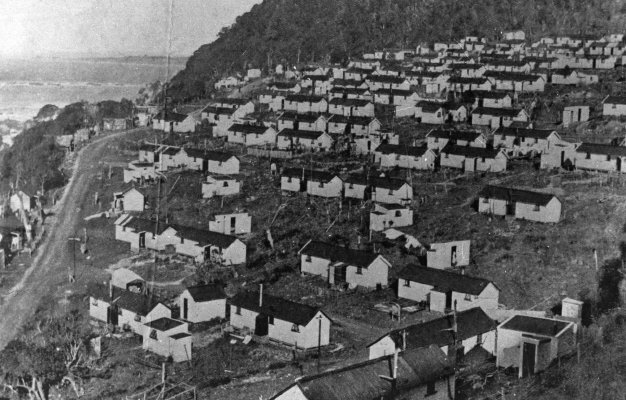 Some of the camps which 'came and went', were at Blue Slip, Shades, Clarence Bridge, Aniseed, the Valley of the Moon, Puketa and Oaro. Construction continued from 1936, until the line opened, in 1945. Aniseed Village Railway Camp. Post Office opened 1937, closed 1941.